The LG Optimus G Pro uses the same gallery app as the Optimus G. It's a custom gallery which is like the stock Adroid one but with some added tweaks here and there. It automatically locates images and videos no matter where they are stored on the phone. By default, images are sorted by albums, but you can sort by location or time as well. The Share feature offers quick sharing via Email, Google+, Picasa, Memo, MMS, SmartShare, Social+ or Bluetooth. The Gallery app displays images in full resolution. Zooming and panning involves no lag whatsoever on the Optimus G Pro. The music player on the LG Optimus G Pro also looks much like the one inside the Optimus G. The interface is simple, easy to use, but still offers a lot functionality. There are equalizer presets, which become available when you plug in a pair of headphones. The video player on the Optimus G Pro has a fairly simple interface, giving you just a grid of all the videos on the device. There's an alphabet scroll to help users locate videos faster but that's about it. You can, of course, play videos from the Gallery if you prefer its folder-centric organization. For each video you've started, the thumbnail gets a tiny clock icon, which shows how far into the video you've gone in. The interface during playback is nothing overcomplicated either, yet it's quite powerful. The live preview feature return back from the dead to the Optimus G Pro - it's a YouTube-esque pop up preview of the video above the scrubber. To get the basics out of the way, the available controls during playback include a scrubber for jumping to various parts of the video along with the standard play/pause and skip buttons. There's a pop-out button at the bottom right corner too, designating that the app is part of the QSlide functionality of the Optimus UI. LG have implemented MX Player-like controls too - a swipe left or right will move the video forward or backwards, while a swipe up or down will influence brightness. One of the new additions is a Video Speed control (you can set values from 0.5x up to 2x). There's a lock button too, which hides all controls for pure full-screen viewing. Another new feature in the video player is Live Zooming. You can zoom in (with a pinch) during actual playback and we mean some serious zoom length, not just a quick resize or fit to screen. 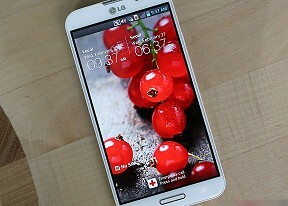 The LG Optimus G Pro handled everything we threw at it - DivX, XviD, MKV and MP4/MOV up to, and including, 1080p resolution. The AC3 audio codec (among lots of others) is supported, so you don't have to worry about the sound either. There are no limitations for the bitrate, file size, etc. LG took Samsung's pop-up play feature a whole lot further with QSlide. In the latest Optimus UI iteration, LG has added a new batch of apps that take advantage of the QSlide functionality. Those include the web browser, Memo, QVoice, Calendar and Calculator. Furthermore, you can launch any of them from the notification drawer. Depending on the QSlide App that you launch, there are different shortcuts on the bottom bar, joined by an icon to resize the QSlide window. The unique feature here is the slider, which directly controls the opacity of the QSlide layer. This way the underlying user interface can be more or less visible.